The Adirondack style of outdoor seating set is never out of fashion so if you are planning to furnish your garden patio you can happily go with this seating style. And with pallets you can create Adirondack range of seating of your own and thus saving a big fortune over the purchase of a market bought set of this kind. Here we have a gorgeous sample with us to let you know the perfect design and structure of this lovely seating genre. So, check out this DIY outdoor pallet Adirondack chairs set with a big size coffee table in the center. The lovely and fun looking chairs are totally on Adirondack design but with a little variation and that is the extra added support to the back of the chair which not only enhances the looks of the chair but also increases the back strength. The coffee table is also unusual unlike a common pallet coffee table design for having a giant size, a patterned top and huge hidden storage space under the table top. 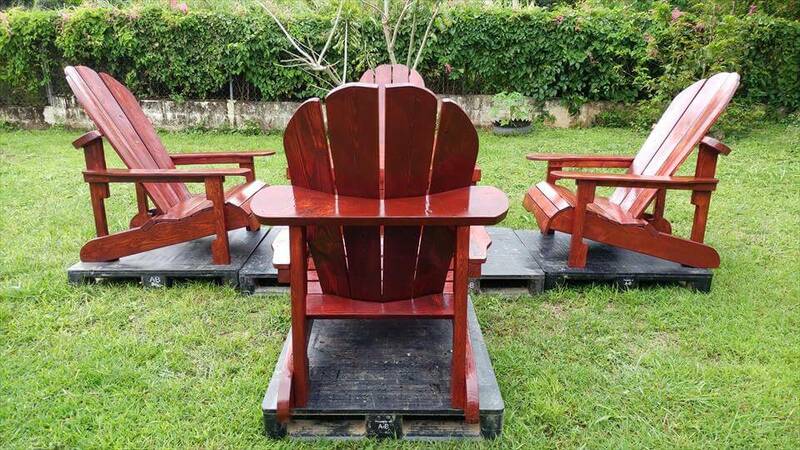 The rich brown stain is bringing out the beauty and rusticity of the whole seating set to grace your garden and patio exquisitely.